Update: These offers for the Citi® / AAdvantage® Executive World Elite™ Mastercard® and the Citi Prestige® Card have expired. Learn more about the current offers here. There are a lot of fantastic credit card perks out there, as credit card issuers are having to compete more fiercely than ever before for your share of wallet. Credit card companies’ margins are down, though at the same time people are using credit cards more and more, so their volume is going up. There are plenty of cards that are incredibly generous yet that I don’t necessarily consider to be “too good to be true.” For example, the Chase Sapphire Reserve® Card is a well rounded, generous card that I recommend for a lot of people, but I get how the card can work long term for Chase. In this post I wanted to look at the credit card benefits that I personally consider to be the most generous. These are many of the benefits that people email me about and say “there’s no way this can last, right?” Well, my general approach is to always take advantage of card benefits when they’re out there, as we don’t know what things will look like in the future. Of the benefits I’m covering, this is the only one that actually relates to the return on spend offered by a card. Specifically, this no annual fee card offers 2x Membership Rewards points on the first $50,000 spent annually. I value Membership Rewards points at 1.7 cents each, so to me that’s the equivalent of a 3.4% return. Offering that as a “no strings attached” return on a no annual fee card is crazy generous. The way I view it, for the average person this is the most useful anniversary free night certificate offered by any credit card, given that the IHG card is the lowest annual fee card to offer an annual free night certificate, and it’s also the only hotel credit card to offer an annual free night certificate without a category or day of week restriction. You can redeem this at virtually any IHG hotel in the world, so almost everyone should be able to get outsized value there, given IHG’s roughly 5,000 hotels around the world. Hyatt’s co-branded credit card also offers an annual free night certificate, restricted to Category 1-4 Hyatt properties. That covers lots of very nice properties, including many that retail for $250+ per night. Most people should be able to get a lot of value out of that. This is the single benefit that has gotten me more credit card statement credits than anything else. The card offers a fourth night free benefit when you book through them, where they’ll reimburse you the cost of the fourth night of a hotel stay at virtually any property in the world. Even pre-paid rates, AAA rates, etc., qualify. This works at everything from a Holiday Inn Express to a $2,000+ per night hotel. 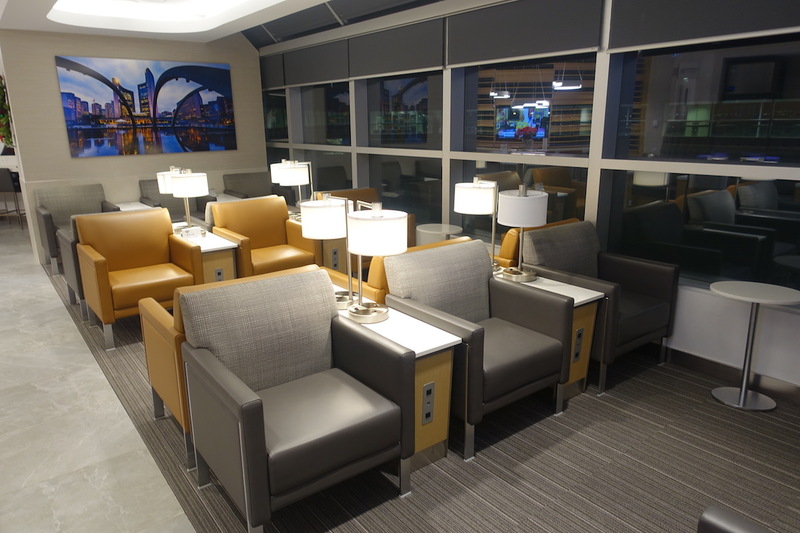 While there are a few credit cards that offer lounge access benefits, there’s something that makes this one unique. The card offers an Admirals Club membership for the primary cardmember, as you’d expect for a card with a $450 annual fee. However, what makes this unique is that you can add up to 10 authorized users to the card, and each of them receives access to Admirals Clubs when they fly as well, even if they’re flying another airline. So with this card you can potentially get lounge access for up to 11 people, all for just the cost of the main annual fee. The way I see it, the above are some of the most generous credit card benefits available today. That’s not to say that the above are necessarily the most well rounded or generally useful cards, but rather that these cards have specific benefits that almost seem too good to be true. I think just about anyone would get outsized value from The Blue Business℠ Plus Credit Card from American Express, the IHG® Rewards Club Premier Credit Card, and The World of Hyatt Credit Card. Meanwhile I think the other two cards are a bit more niche — if you stay in hotels a fair amount in increments of at least four nights, the Citi Prestige® Card will pay for itself time and again, and if you’re an American flyer, the Citi® / AAdvantage® Executive World Elite™ Mastercard® is the best way to access Admirals Clubs. Are there any other major credit card benefits you consider to be (almost) too good to be true? Trying to justify getting one. @Adam H – I too was trying to justify getting one (I have so many credit cards, and didn’t want to add yet another ~$500 annual fee to the mix). But I was home over the holidays, and casually mentioned it to my two brothers (we’re all generally AA loyal, all live in different cities, and all travel a decent amount for work and pleasure). Ended up deciding to just split the annual fee, and all get these cards for the three of us. $150 for an Admirals Club membership is a no-brainer. Mention it to a friend or two who travels a lot, and you’ll likely find somebody who’ll be happy to go in. Uh, if you put an authorized user on your credit card, and the AU spends a lot and refuses to pay for it, YOU are responsible for the charges, not the AU. So, unless the Admirals Club card and credit card are physically different, this wouldn’t work very well unless you have a spouse-like level of trust with the AU. All of these benefits are great values IF you can actually take advantage of them regularly. I struggled to make use of the 4th night free benefit (but did use it occasionally) because I like vacation homes instead of hotels. The annual free night from IHG has been extremely useful, however. For instance, it lets me tack on an extra night at the end of a vacation in a transit city – and I’ve had little trouble using it at some very fancy hotels that I’d normally never pay for. @ snic — You can always reduce the credit line on the AU card if you’re concerned about that. The only too-good-to-be-true benefit is 65,000 AAdvantage miles bonus from Citi, once a month, every month (no 24-month limitation if you have 9-digit invitation codes—and, after all, who doesn’t?). 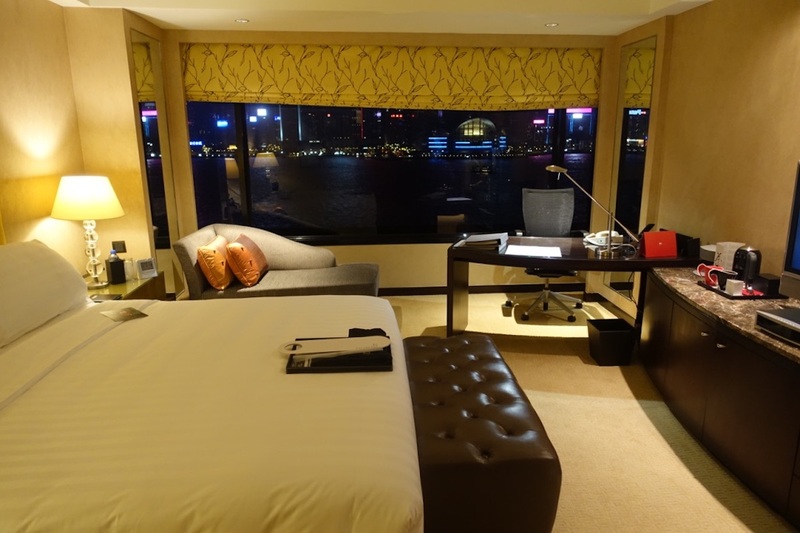 I find SPG and Hilton Gold statuses with AmEx Platinum to make it really worth it for me. Room upgrades and free breakfast anytime i stay there. The $100 off for two or more tickets on the Ritz-Carlton Chase card. That combined with the fourth night free on the Citi Prestige more than pays for all my annual fees every year. @snic, do you really not have friends who you wouldn’t trust to simply hold a card and not spend on it? You missed the Morgan Stanley Amex Platinum’s free Authorized User. other than waiting to get lucky and receive the mailers, how does one receive the 9-digit codes? I think I made profit on the Citi-P-card like $2k and the years not UP .I’m into my second $250 travel thing BUT who cares I NEED THE 4th NITE FREE or I’ll b setting in the Cave watching the Travel channel . The IHG card is interesting. Is there a referral link that helps Lucky? Is there a risk of applying for too many credit cards? I think Lucky believes that is not too much a problem, maybe 10% of the credit score. Already saving $500 this month on 4th night free. One stay a year pays for the card for me. Put my BBP back in my wallet now that the calendars year reset. And excited to use IHG free night at Kimpton now! Yes, but what if we have a falling out? Anything can happen. That could, in theory, happen with my wife, too, but having just one person I share credit cards with greatly minimizes the risk. In general, friends and money don’t mix. @lucky what about the Marriott card, that also give a free night? Why don’t you ever mention that or/and why don’t you have that card? We use Ritz $100 off two round trip tickets a lot. We travel a fair amount together domestically when it doesn’t make sense to use points, the fares are cheap, but getting $50 off each fare is great. We aren’t in a SW market so a companion pass doesn’t make sense and we use the Alaska passes easily. We used it 7 times last year. I’ve just booked two trips with it for 2018. It’s the only reason we hold onto Ritz. They have an easy to use travel credit so the AF comes out to $250 therefore it’s clearly a money maker for our household. @John Smith I don’t know why he doesn’t mention the free night, but since the merger it makes more sense to use the SPG card at Marriott as you get 6 vs 5 points, and it’s really not interesting for any other spend. They really need to do something to that card. 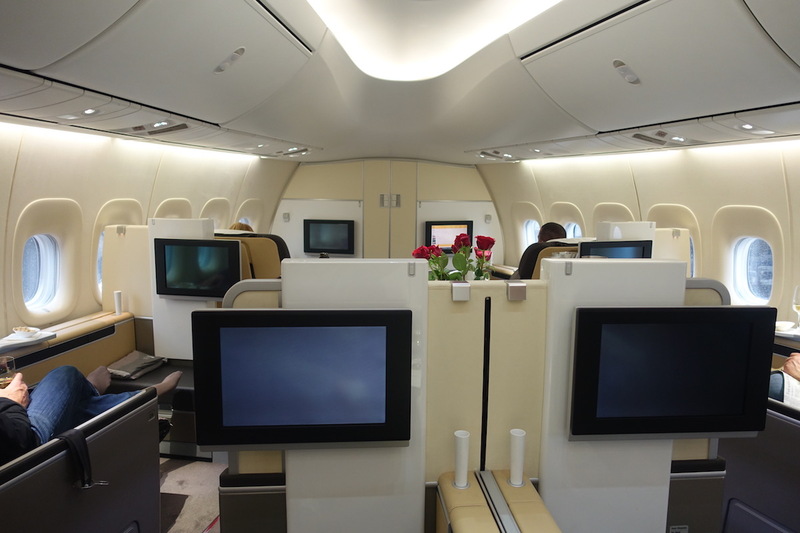 What airline cabin is in the photo. It is fabulous! @Victoria – I think it’s Lufty, at the front of a 747.
re: Chuck Lesker – Sorry but I don’t understand what he is talking about. Are you able to get a new card every month or is there a nine-digit code that we can register to get the 65k bonus with the card we have? Thank you for any info you can provide. Yes. Please tell me more about the AA card. I thought you could only apply every 24 months. The ML Octave Black and the Stratus Rewards Visa. Both are excellent but as usual, I find Amex to have an edge with regards to treatment of customers. Prior to this, my favorite card was the Amex Plat so the Octave is naturally an upgrade. Just be aware that the IHG free night appears on the anniversary (like the Marriott and Hyatt), so you’ll be waiting a year with a new card to get it. But any Kimpton Karma free nights from 2017 can be used for *other* IHG properties now. The Marriott benefit is only for cat 1-5 properties, so that’s probably why it’s not listed. For example, there are no cat 5 or lower properties within 50 miles of Asheville NC. My first thought when I saw the headline was the Chase Ink cell phone protection / insurance. I just got a mail offer for the Capital One Spark for Business card. It is rubbish in that it involves no miles, ha ha. If you pass $10,000 spend in the first 3 months, there’s a cash back bonus of $1,000. $59 annual fee waived the first year. 2% cash back. I would have trouble making the $10,000 mark unless I really bunch up spending so I’m not applying for that. $1,000 is the highest that I’ve seen though if you monetize 60,000 miles (one of Lucky’s referrals to the Citi AAdvantage Platinum Select MasterCard – no annual fee), 60,000 miles can buy a ticket of greater than $1000. I would imagine the Admirals Clubs are becoming pretty crowded with all the credit card users. On the CP Fourth Night Free, just make sure to use the Citi Prestige Concierge. DON’T book online through the Citi Thank You portal, or call the Thank You travel number. Those are considered 3rd-party website rates, so you don’t earn points, get elite benefits, get access to AAA rates, etc. I stupidly made that mistake. Luckily it wasn’t a non-refundable rate so I just canceled a few days later once I realized what I did and started over.